Welcome to Kent Hotel in Icmeler. 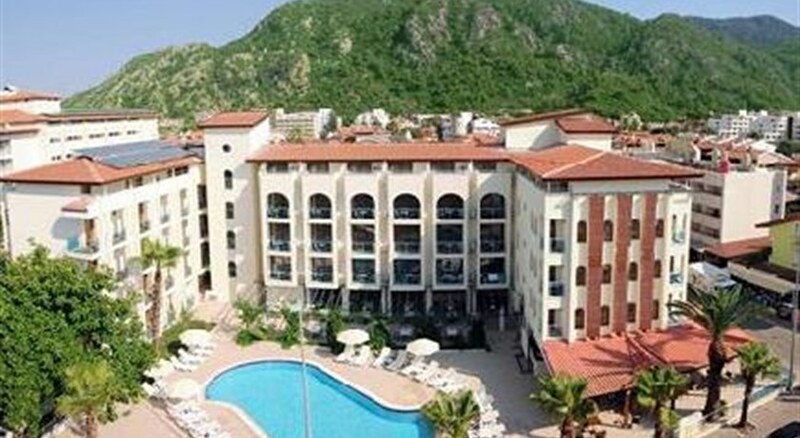 The sandy and gravel beach is 100 m from the hotel and the town of Marmaris is 7 km away. To make your stay more comfortable a reception, air conditioning and a lobby are available. The staff in this 4 storey hotel speaks English and German. For guests who wish to be mobile, car rental can be arranged. The hotel features a fresh water swimming pool, seasonally open with a separate children's pool. For convenience, refreshing drinks are offered at the pool bar. Sunshades and sunbeds are available for an additional fee at the beach and free of charge at the pool. Accessible from the hotel: airport DLM (104 km), Marmaris Castle (8 km), disco (400 m), Marmaris Museum (9 km) and Aqua Dream Water Park (6 km). The hotel is within easy reach of taxi stands, bars and restaurants, city centre and supermarkets. For your entertainment the hotel features a TV lounge. For convenience the following services are offered: currency exchange, wake-up service, medical care and maid service. This family friendly hotel offers a children's pool to ensure a comfortable stay for parents as well as young guests. Reception hours: 24h Service.